There are lots of great kids' bath activities, all designed to make bathtime enjoyable. Most kids fall into one of two categories: they either love the bath or they absolutely hate it. Does your kid love bathtime, or does he fight taking a bath? Sometimes babies and toddlers actually become frightened of the bathtub. They either don't like the running water from the faucet, or they may be afraid of the drain, imagining that they could disappear down the hole just like the water does! Why not make your kid's bathtime a fun part of the day? These kids' bath activities can help. There are lots of ideas on the market, but you can also come up with some of your own. Bubble Bath - What kid doesn't love a bubble bath? Be sure you purchase bubbles that are gentle and tear-free, though. Soap Characters - Children's soaps come in lots of shapes, including animal characters. This is always a favorite. Squeaky Toys - Simple and fun, toddlers especially love to give their squeaky toys a bath. Give your child her own washcloth, and let her bathe her toys. Some toddlers love holding things under the running water. Be sure you always supervise closely to keep your child from turning the water to a hotter temperature! Cups and Bowls - You don't have to go to the store and purchase costly toys for your child to enjoy. Just check out your kitchen cabinets. Give her several cups, bowls, spoons, etc. to play with in the tub. Magic Washcloths - Kids love to get those little, terry cloth animals and figures which expand into washcloths when placed in the water. If you are looking for a few bath items to purchase, check out stores such as Walmart, Target, or Kmart. For a great online store, check out Growing Tree Toys. Rub a Dub Artist in the Tub - recommended for ages 2 and up. Check out the following Internet sites for great bathtime activities and ideas. 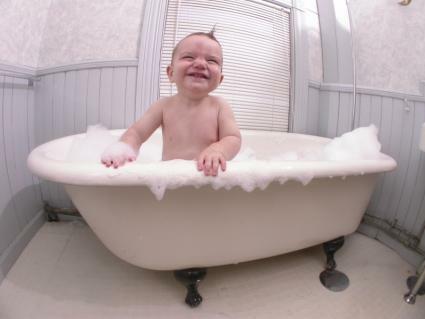 No matter what type of bath toys you choose, it is important to supervise infants and young children while they bathe. Always stay within arm's length away from your small child. Fatal bath tub accidents can occur in as little as two inches of water.